I take medication for my post natal depression. "I'm not ashamed to say I'm still on medication for my postnatal depression." Kath, 41, mum to Caitlin, 4 and ½, is not ashamed to say she has continued medication for postnatal depression since her daughter was two months old. It was probably around three weeks after I’d given birth to Caitlin that I really began to feel not like ‘myself’. I remember sitting in Caitlin’s bedroom breast-feeding her one night with tears rolling down my face. I wasn’t happy and I did not like my new life at all. I was angry at myself for feeling this way, especially after we had tried to conceive for over three years. I started to resent my husband as he didn’t have to do as much as me. Everything became a struggle and I was starting to feel suffocated. I was so sleep deprived due to feeding her every two-to-three hours, then there was the settling for one-to-two hours after each feed. And the screaming... oh, I could not bear it anymore. There were some pretty nasty days. One particular day I sat outside listening to Caitlin’s muffled screams from her bedroom for about an hour. I needed a break from her crying. The more she cried, the more I cried. I remember screaming at her to just shut up and then I’d have to leave the room. I started to understand how a new mother could hurt their baby. My relationship with my husband at this time was not the best and to be honest I didn’t really care. I cried every day. When Caitlin was about four weeks old I had booked a photography session. I was so close to cancelling that appointment. I had just bathed Caitlin, put her in a nice new jump suit and then she threw up all over her clothes - just as the doorbell rang. I felt the tears welling up inside me. As I had predicted she cried and cried and cried, I couldn’t settle her. I couldn’t have thought of anything worse to do than go and view those photographs of Caitlin. We met the design consultant and all I could think was “wow she looks great, she has so much confidence, she loves her job - she’s working and I’m not”. I did not feel confident with Caitlin and I was always on edge. But I had the opportunity to swap a few “mother’s notes” and this woman shared with me that she suffered with PND with her first child. Things slowly started to click together inside my head…is this why I am feeling this way? I mentioned to her how I’d been feeling and she gave me the push to do something about it. My greatest fear was admitting to myself that I was suffering from depression because it was like admitting defeat. I kept trying to tell myself that I’d feel better soon, that it was just because I was tired. About eight weeks after becoming a mum to Caitlin I finally saw my doctor. I walked into her office and burst into tears. Then and there she did a K10 test (depression questionnaire) and confirmed that I was suffering from moderate postnatal depression. She arranged a mental health plan for me which consisted of a combination of psychology sessions and prescription medication. I’m not ashamed to say that I am still currently on medication, four and a half years later. I feel “normal” when I am on medication and most days I can handle most things pretty well. About two months after starting the medication I remember thinking “I feel happy, I feel normal, and I love my baby”. I started to enjoy life again and I was enjoying my daughter, Caitlin. Did you experience postnatal depression? How did you cope? A woman is more likely to develop a mental health problem around the time of having a baby, moreso that at any other time of her life. Postnatal anxiety and depression can be serious and can have long-term and far-reaching impacts upon mothers, babies, partners, other members of the family and the community at large. Mental health problems are among the leading cause of maternal death and disability: The number one reason mothers die is due to suicide. For some women, medication is an essential component of their treatment of moderate to severe depression or anxiety. There are medications that are safe and effective, and psychological (talking therapies) are also effective for treating mild-moderate depression and anxiety. For more information about safe and effective treatments and knowing when to seek help visit www.cope.org.au. The #nofiltermum campaign is a joint initiative of The Hood, a premium clothing brand celebrating mums supporting each other with COPE, the Centre of Perinatal Excellence, Little Tsunami and Katrina Christ Photographer to challenge the unrealistic perception of ‘parenthood perfection’ during Post Natal Depression Week. 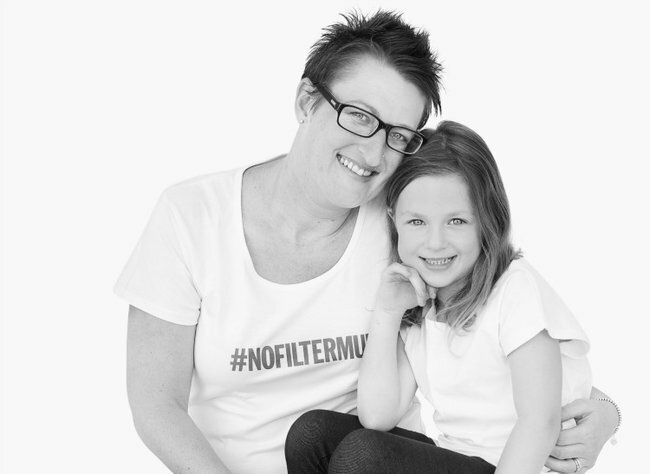 You can join the campaign by posting a no filter photo of your everyday life on Instagram tagged with #nofiltermum or by buying a t-shirt from The Hood.